In a World of its own, the Mullion Cove Hotel in South Cornwall is a celebration of quality, style and service. 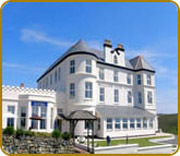 A Cornwall hotel combining traditional values with modern amenities in a simply unrivalled coastal setting. The Mullion Cove Hotel in Cornwall is situated on the Lizard Peninsula in South Cornwall and stands on the cliff top overlooking the stunning harbour and fishing cove. This Cornwall hotel is dog friendly and ideal for short breaks and walking holidays in Cornwall. The Mullion Cove Hotel is a well established AA 3* hotel in Cornwall and is situated in a stunning cliff top location overlooking the sea and harbour on the Lizard Peninsula in Cornwall; with uninterrupted sea views. Mullion Cove Hotel in Cornwall has 30 comfortable AA 3* non-smoking ensuite bedrooms all with private bathrooms and most with stunning sea views. Bedroom facilities include: remote control colour TV, direct dial telephone, tea and coffee making facilities, hairdryer, individual heating and complimentary toiletries.